SLO Progressives protest at local meetings, but is it working? 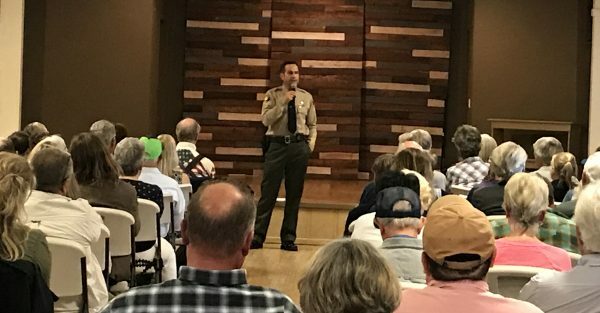 Approximately 120 people attended a sheriff’s town-hall meeting in Santa Margarita last week, including a small group of Progressives. While a handful of Progressive held up matching orange signs that said “lie,” as Sheriff Ian Parkinson spoke, Nick Andre filmed the meeting. Andre serves as a co-chair for both the SLO County Progressives and the SLO County Democratic Party. He is also the owner of a political consulting firm that is paid by the campaigns of sheriff candidate Greg Clayton, district attorney candidate Mike Cummins, and District 4 supervisor candidate Jimmy Paulding. Following Parkinson’s speech, attendees were provided time for questions and answers. 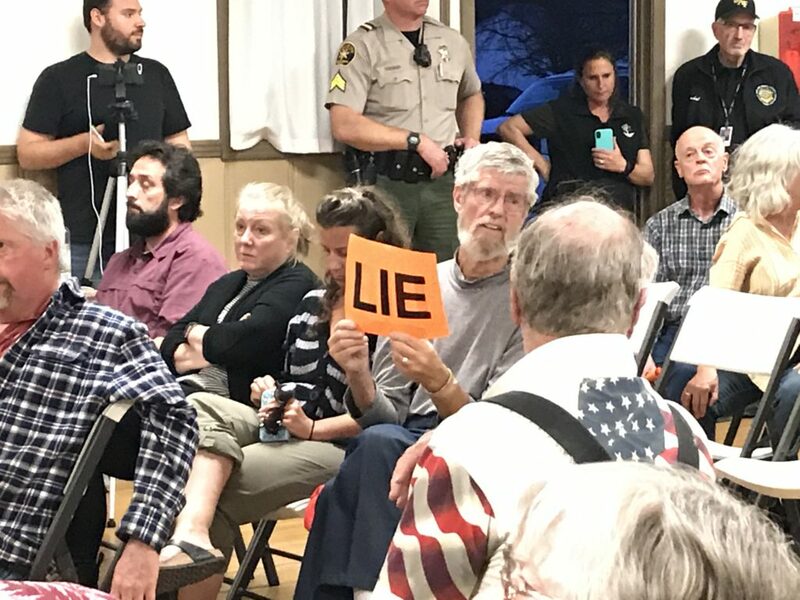 Several of the protesters read the same questions their group had asked at two earlier sheriff town-hall meetings, one held in Oceano and the other in Nipomo. As the exchanges between Parkinson and several of the Progressives became heated, the protesters began interrupting Parkinson and members of the public attempting to ask questions. Approximately a dozen attendees responded by yelling at the Progressives to let the sheriff talk, to knock it off and that they were out of order. Wednesday’s meeting was the fourth time the Progressives have protested the death of Holland at local public meetings. In late February, the protesters marched to the front of the SLO County Board of Supervisors chambers and refused to set back down. As a result, the morning session was shuttered. The Progressives have voiced plans to protest again at Tuesday’s board of supervisors meeting. We need a bunch of rednecks to show up at the meetings and shout them down. Of course its working more and more people are seeing what these progressives are up to and what they are doing, they’re doing a better job of running themselves in the ground than us “regressives” here on CCN could ever do. We all have a moral obligation to make sure the SLO Progressives fail, and it starts with defeating Adam Hill, Heidi Harmon, Caren Ray, Jimmy Paulding, Bruce Gibson, and Nick Andre. These people crave power, and they will say and do anything to obtain it. The SLO Progressives attack prosperity and attempt to gain power by advancing a false narrative that people are being oppressed, but they themselves are the oppressors and, if they gain power, we will see a reduction in freedoms and higher taxes on working class people. The progressives have barred many people from their private Facebook page including Grover Beach Councilwoman Debbie Peterson. Basically anyone who has questioned Supervisor Adam Hill’s bad behaviors. The Progressives also kicked off several members for linking to Cal Coast News articles. So this group supports accountability for Andrew Holland, but does not allow the stories about his death for their private page. That is because Supervisor Adam Hill does not want his bad actions exposed. So they bar a media while giving another media credit for the work. Isn’t freedom of the press a civil right that is as important as the civil rights of inmates? On their private page, they demean women who have no ability to respond to their nasty comments, because they are barred while Hill, Tom Fulks and Aaron Ochs have full reign. Ochs who has posted on line that he wants to throw bleach in the eyes of the daughter of a Cal Coast News reporter because he is paid to attack anyone who questions Adam Hill. Our county needs people who support all civil rights, and not just those that help promote their political agendas. Not a fan of Ian Parkinson, primarily because of the lies his department disseminates. But I sure do not want the Progressives, with members like Adam Hill, Aaron Ochs, Tom Fulks and Nick Andre, having any influence over law enforcement in our community. They are group of rude, uncivil, sexist men who fail to abide by laws and who believe the ends justify the means. Just more activiats claiming solidarity with the “opressed” yet only motivated by hate of the “privileged”. Will bombings be next ala the weather underground?